[toc]Knee arthritis is a condition characterized by inflammation, stiffness and pain in the knee. It happens due to damage in the cartilage that lines the knee joint, which results in rubbing of bone on bone. There are various treatment options that can be very helpful in relieving the pain and returning mobility. The treatment plan usually includes a combination of medications, alternative therapies, regular exercise and diet remedies. 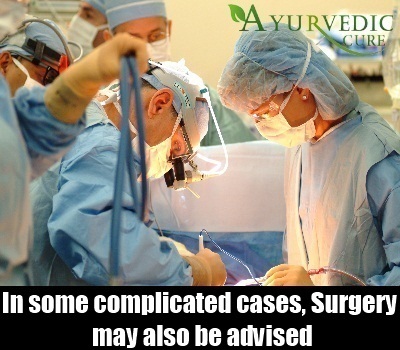 In more complicated cases, surgery (like knee replacement) can also be advised by your doctor. 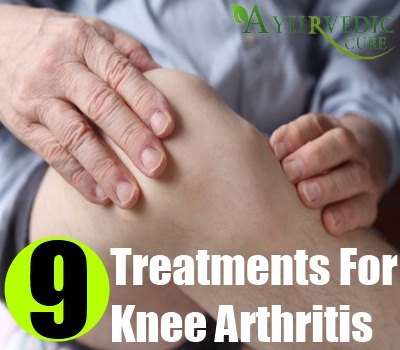 Following is a brief rundown on some of the treatment methods that can stop the progression of knee arthritis and provide you great relief from inflammation, stiffness and pain. Practicing the right type of exercises regularly is an integral part of the treatment plan for knee arthritis. The exercise regimen ideally includes a combination of mobility exercises, strengthening exercises and aerobic exercises. The great thing about aerobic exercises like cycling and swimming is that they strengthen your muscles and also provide better mobility to the knee joints. Stronger muscles provide better support and thus relieve pain as well. On the other hand, the primary goal of mobility exercises is to keep your knee moving, as it can relieve stiffness and inflammation to a great extent. Walking, for example, is the best exercise. Keen runners should consult their doctors and practice running the way they are advised. In general, running on hard surfaces should be avoided, but slow running on grass or treadmill is often beneficial. In any case, refrain from overdoing any particular exercise. Providing warmth to knee joints is a very effective way to reduce pain, swelling and inflammation caused by knee arthritis. 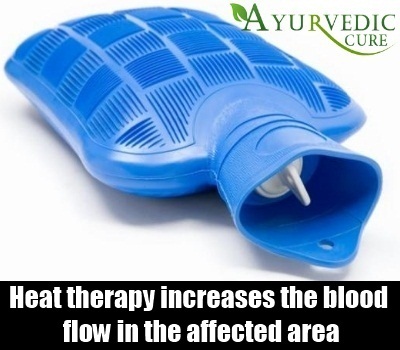 Heat therapy increases the blood flow in the affected area, which makes you feel very soothing. All you have to do is just to wrap a bottle filled with hot water with a towel and then place it on the affected knee for fifteen to twenty minutes. Repeat this procedure for 2-3 times a day. Lack of movement of knee joints can aggravate stiffness. The fluid contained in knee joints lubricates the joints, allowing them to move smoothly. Regular knee movements are crucial because it pumps the fluid into the joints and enables it to function properly. When you stay still for a long period, no pumping is done, the fluid dries out quickly and so does the lubrication. Therefore, you are advised to do some simple stretching or bending exercises every twenty minutes throughout the day. If you are overweight, you must work on to lost those extra pounds. 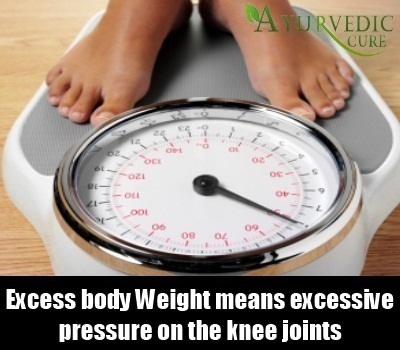 Excess body weight means excessive pressure on the knee joints, which can aggravate the arthritis condition in the knee. Various research works have been conducted in this regard and it has been found that just by losing 5-10% of your body weight can dramatically increase the mobility of the joints and reduce the pain and inflammation in the affected area. However, for obvious reasons, this option is not at all recommended to those who are already under weight. You must strictly avoid high-heeled shoes because they put excessive pressure on the knee joints. Use low-heeled shoes preferably the ones with soft-cushioned soles. The soft cushion acts as shock absorber, which further reduces the pressure on the knee. People suffering from knee arthritis are often advised to use stairs instead of escalators or lifts, particularly if they have to go up or down just one or two floors. This can be a painful task but you can take some of the pain away by practicing some cautions. For example, you must take support of the handrails while using the stairs, as it will reduce the pressure on your knees. For more comfort, you should do just one step at a time. 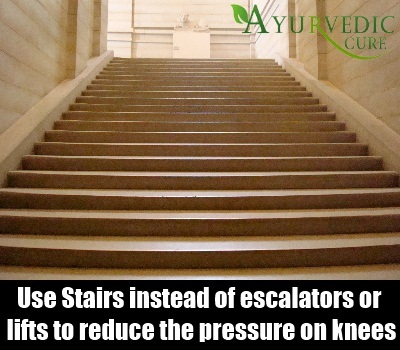 Also, if one of your knees is fine and only the other one is affected with arthritis, you should lead with the affected leg while going down the stairs and with the healthy leg while going up. These simple cautions can make your life healthier and more comfortable. If you experience pain and discomfort in the knee while walking, you may find the use of a crutch or a stick very beneficial. The use of a crutch can take away the excess weight from your knee while you walk. On the other hand, stick can be helpful for you to balance your body. An important thing to keep in mind is that the crutch or the stick must always be used on the opposite side to the affected leg. It means you should use the stick in your left hand if your right knee is affected and vice versa. The reason behind this is that it is always the opposite arm that swings with the opposite leg while you walk. 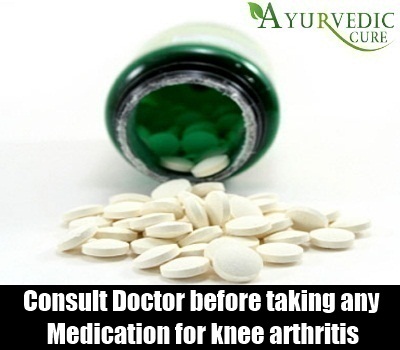 The medications used in knee arthritis can be prescription medications or the over-the-counter ones. But, you must consult your doctor first before using any of them. NSAID (Non-Steroidal Anti-Inflammatory Drugs) is the most commonly used medications for knee-arthritis patients. Ibuprofen is a popular choice that is available over the counter. But, you will need a prescription for stronger anti-inflammatory medications. Pain relief medications are also important. They may not cure arthritis, but they can relieve pain for a short period of time, allowing you to continue with your daily routine without any discomfort. This way, pain relief medications can indirectly help you to increase the mobility of your knee joints. Though in most cases, the above treatment options prove to be enough to control the progression and symptoms of knee arthritis, yet in some more complicated cases, surgery may also be advised. Knee replacement surgery is the most common. Partial knee replacement surgery is advised when only one side of the knee is affected. Total knee replacement is performed when the area affected is more widespread. Besides the treatment options as mentioned above, it is also very important for you to take proper diet. Some of the foods that can be very helpful in treating arthritis in the knee include foods rich in vitamin C like sweet peppers and citrus fruits. Vitamin C provides better protection to collagen, which is one of the most crucial components of cartilage. Fatty fish like sardines, herring and salmon are also good foods for knee arthritis patients. Fatty fish contain vitamin D which helps in relieving soreness, stiffness and swelling. Also, the Omega-3s they provide to your body helps reduce inflammation by preventing the production of those chemical that cause inflammation.